You can eat a lot of regrettable Caribbean food in this town before coming across an establishment worth chirping about. Peppers & Spice, fortunately, is just such a place. No matter the time of day, there seems always to be a queue at this takeaway – something that can't really be said about the other Caribbean eateries nearby nor of Peppers & Spice's closest lunchtime competitors. Not ones to miss out on a good queue, Londonist decided to investigate and see if Peppers & Spice is worth the wait. 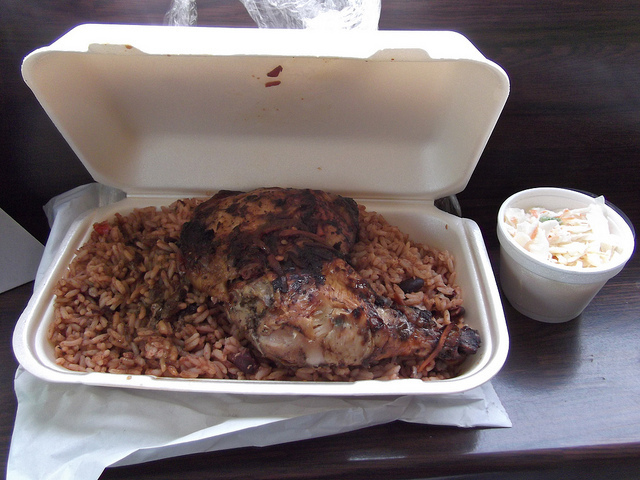 For our lunch, we went with the charcoal jerk chicken meal (all dark meat including “rice and peas” and a choice of salad, £5.50 for a small, £6.50 for a large) and were right well pleased with its sticky sweet and mildly fiery flavour and its massive proportion. We'd be pleased to have it again – but that 'again' would need to be an especially hungry occasion. However, overhearing order after order made for the mutton soup during our midday dine had us wondering if we'd chosen the best dish for that particular day. A piled high range of home made patties and cakes (also popular with the continuous line of customers) made us second guess the wisdom of going for the large meal. A small order would perhaps saved us some money and tummy space for a callaloo patty or piece of carrot cake. All patties and cakes are priced under £1.50. Seating is limited to just a few barstools here. And as said, it's a happening little joint. So, when you go, it's probably best to plan not to eat in. They pack and wrap your food up securely whatever the case. Peppers & Spice is located at 40 Balls Pond Road, N1 4AU (there's another in Tottenham as well).